What we didn’t tell you was that the preemption was a diagnosis of State 4 Colon Cancer for our very best friend, Pick Up Sticks copywriter and blogger, Bunny. The week before Thanksgiving she went to the emergency room in Santa Fe, with a referral from an urgent care doc convinced that she had appendicitis. Alas, it wasn’t her appendix acting up. Like everyone else, when we heard the words “Stage 4”, we found ourselves in a bit of a panic. As some of you who have seen us all together at market know, Bunny is our family. She is like our sister, but loves us like a best friend and we love her back accordingly. We’ve know each other since first grade and we’ve shared prom dresses and rides with bad boys in pickup trucks and days on the lake in bikinis and several marriages starting and ending and a thousand family dinners and dancing all night in dive bars in New York. . and meeting you in our booth at market. Bunny’s a freelance writer and we’re just one of her clients, but when she writes about Pick Up Sticks, it’s from the heart and from long experience. She was with us at our very first retail show (Country Thunder in Phoenix) and has helped us nurse this business into fruition from day one. That idea grew, and Bunny’s Mom, Betty, who is one of our exclusive retailers in Logan, NM (our hometown, of course) looked through the catalog and found a charm that expressed Bunny perfectly. She then ordered every single one we had in stock, put out the word, and in the past three weeks, has sold almost 200 charms. She’s sold them at a higher profit margin, putting all that money made into a benefit account for Bunny, who unfortunately, will have rather high out-of-pocket costs for the next six months while she begins chemo treatment. We’re taking it one day at a time, trying to deal with what could be a dark diagnosis, and we’re watching Bunny turn it into learning and loving experience, which is what she does with her life every day. For those of you who know her, you can follow her journal entries at www.caringbridge.org/visit/bunnyterry. Send along an encouraging word if you’re so inclined. 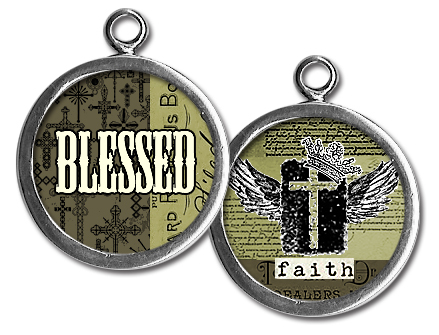 We’re honored that Pick Up Sticks charms are adorning the necks of women from Maine to California who are daily reaching up to hold that charm and Bunny’s well-being between their fingertips, wishing her well and saying a prayer for her. She’s slated for 20 chemo treatments at the end of which her oncologist will explore surgical options. She’s got one under her belt and is feeling great. And she gave up the blog for this ONE post. . .otherwise she says she’ll be back with a vengeance next week to talk about new designs or something like that. 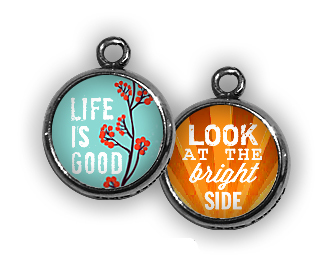 If you have someone in your life who is going through something difficult and you need a little help picking a special charm for them, let us help you out. This charm project for Bunny has been one of the most rewarding things we’ve been involved in since we started the business. And of course, we’d appreciate your prayers and good thoughts sent her way. We’ve written about charm bracelets before, back in the early days of the blog. At Pick Up Sticks, we learned quickly that women of all ages love unique jewelry that tells a story, with pieces that commemorate special occasions and milestones in one’s life. For centuries, charm bracelets have been the perfect way to tell one’s story. They are truly the original timeless classic. Is it the universal appeal of the sound a charm bracelet makes, that feminine jingle jangle as you move your hands in an expressive moment? Is it the fact that folks have to get up close and personal to check out your charms and hear the tale of how important each is to you? How many of us have a charm bracelet that belonged to our mothers or grandmothers, and how intriguing are the stories conveyed by those heirlooms? We love this photo of Sabrina’s Mom’s charm bracelet, started when Dee was a teenager on a European trip with, of all things, Seventeen Magazine. It’s easy to imagine a group of pretty young girls in shops in Germany (the beer stein), Paris (Eiffel Tower), Switzerland (cuckoo clock) and Venice (gondola pole) going through charms and laughing with delight when they found the perfect trinket to symbolize their travels. The photo in the charm is Sabrina’s Dad (with her Mom on the reverse side) and is, coincidentally, the first photo charm Sabrina ever saw. Want to know the story of charm bracelets themselves? The Egyptians wore them in 3000 BC to let the gods in the afterlife know who they were in the social hierarchy. The Babylonians wore charm bracelets in 700 BC because they believed charms had special powers. In medieval times, charm bracelets were worn to identify your family of origin and the fiefdom in which you lived. Queen Victoria wore them in the late 19th century, first as a fashion statement, and then as a way to mourn her great love, Prince Albert. She had her personal jewelers create charms with locks of Albert’s hair and others with his photo. And at the 1889 Paris Exposition Tiffany & Co introduced the general public to a chain link bracelet with a single heart pendant hanging from a link. U.S. World War veterans introduced the women in their lives to charm bracelets when they brought home charms from the various European cities and South Pacific villages they’d visited. Charms were inexpensive gifts, easy to carry, and soldiers were anxious to commemorate the positive aspects of their travels. In the 40’s, you could get charms out of gumball machines – they were universally available to anyone with a whim for creating their own jewelry. Historians believe that even cavemen in prehistoric times wore charms and amulets to ward off evil spirits and to demonstrate one’s prowess to an enemy, And over time, in all these cultures, adding charms has always been a way to mark milestones in one’s life. And now we do it. 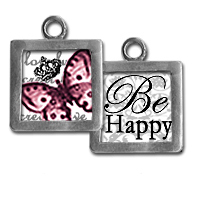 Charm bracelets have experienced a revival in popularity since the turn of the new century, and at Pick Up Sticks, we’re combined double-sided photo charms conveying a message with coordinating trinkets to create very personal wearable art for each charm bracelet customer. Our vintage inspired charm bracelets offer each customer a chance to tell her own story. Which, evidently, is what all women have been doing for centuries. And centuries. And centuries. That’s why we do what we do and why we create Pick Up Sticks jewelry – so that we can tell our stories and hear your’s. If you don’t have a charm bracelet yet, or if you want to help a friend/daughter/niece/loved one start that tradition, consider starting with this Pick Up Sticks bracelet and a charm or two. It’s a unique, one-size-fits-all treasure that future generations will cherish. This Thanksgiving week, all of us at Pick Up Sticks are feeling some pretty extreme gratitude for a number of things both complex and simple. We’re alive and doing well, the New Mexico sun is shining and the forecast is that it will stay that way through the holiday, and our kids and parents are all healthy and happy. We started to post this last week with a reminder to you to order charms showing gratitude so that they could be sold for Thanksgiving. But our week got preempted by life (as weeks sometimes do), and when it was over and the dust had settled, we all agreed that we’d much prefer to write a post about a year-round attitude of gratitude. We’re big on Thanksgiving at Pick Up Sticks. When you love family and friends and food as much as we do, Thanksgiving is a much-anticipated holiday. But we’re also big on thanksgiving, little “t”. The type of thanksgiving that you do every day when you wake up and notice yourself breathing, when you get a phone call from a long-lost friend, when the sun shines through your patio window just right, when you find a book or a song that makes your heart smile. We’re big on hope as well, and we’re very thankful for what that hope gives us right now. 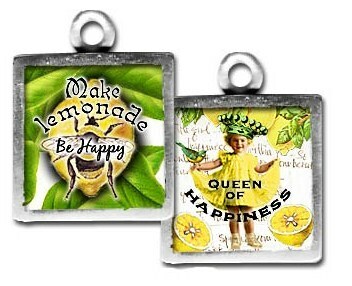 We’ve created a number of charms over the years, and we’ve found that our customers share those sentiments. 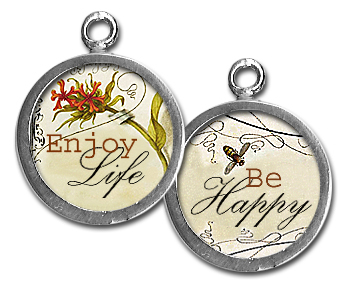 We know this because, besides the initials, the charms that remind us to be grateful, enjoy our life, love ourselves and others – those are the charms that year after year consistently sell very well. We hope your holiday is filled with lots of love and laughter and food, but more than that, we hope your entire year is filled with those things. We’re very thankful to have you as customers. 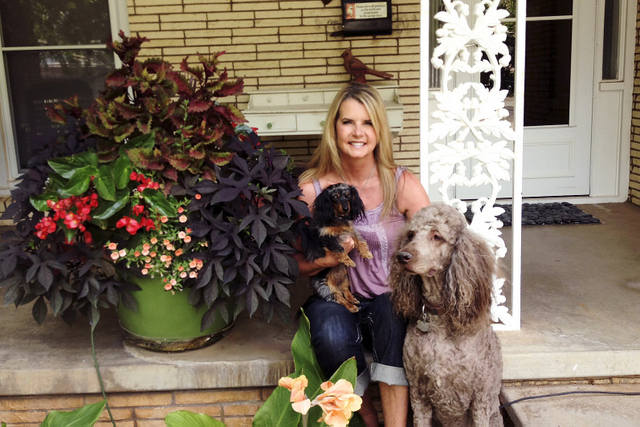 Glena, Daphney (miniature Dachsund) and Logan (standard poodle) on her front porch, surrounded by the results of her gardening skills. In our previous post on Sabrina’s house, we talked at length about how the homes of the Pick Up Sticks crew are their own form of art and inspiration. Having a place that both envelopes you with comfort and provides you with inspiration has always been Glena and Sabrina’s goal. I’ve known them both forever, and their ability to create a home that is both beautiful and inviting is pretty incredible. What’s even more amazing is how Glena’s home reflects her personality. Glena’s the details person at Pick Up Sticks. She’s the partner with the business and finance degree who, while helping with the creative process, makes the train run and stay on the tracks. She’s the precision behind the ordering process, setting up the shows, handling the inventory issues, keeping the staff on track. . . and interestingly enough, even though she’s a details person, she also has an innate ability to see the entire big picture, making sure every piece of the puzzle fits. Her house is, like Glena, a collection of appealing details that make for a very comfortable and beautiful whole. 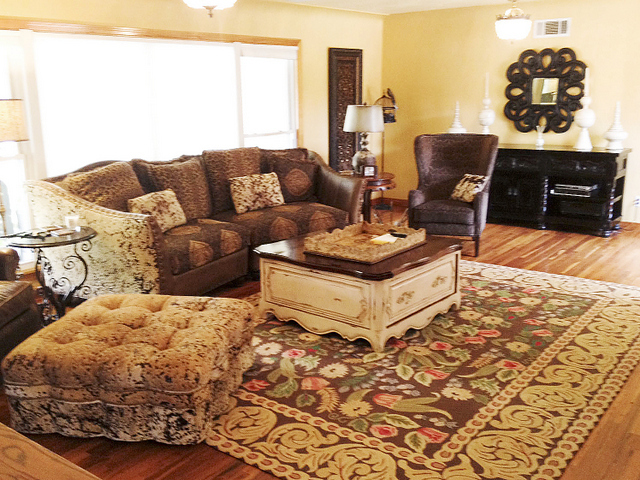 Her living room, pictured above and below, is the perfect blend of new furniture she purchased at market (she says she loves Guildmaster), antiques, and odds and ends she’s picked up at junk stores. You can see that the couch is big enough for the entire family. It’s where they pile up with dogs and drinks and popcorn and watch movies. Her favorite piece of furniture in the entire house is the antique seed cabinet pictured above. It was originally in a hardware store, and every drawer is metal-lined because its purpose was to store a variety of grains and flower seeds. 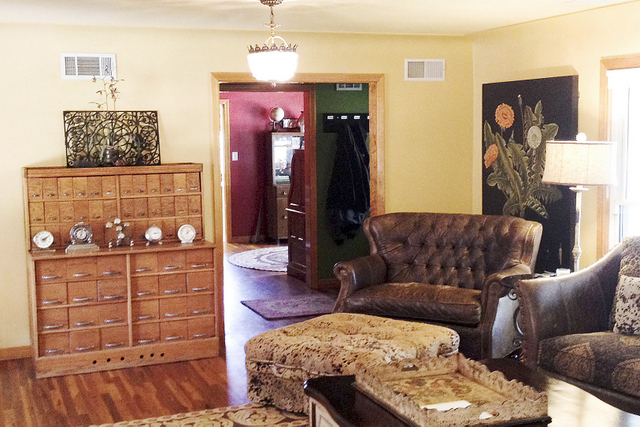 She uses it to display her favorite things, including her collection of antique clocks. 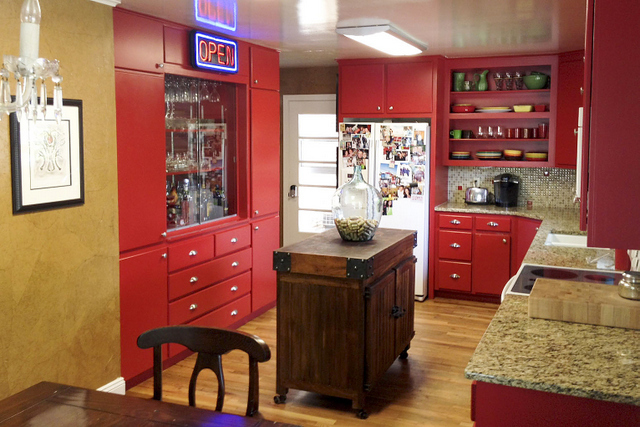 Who wouldn’t be inspired in Glena’s kitchen? I love this room – it’s the place where we all tend to congregate in the evenings, waiting on one of her go-to dishes which include red chile enchiladas, calabacitas, grilled salmon and grilled artichokes (hmmmmm. Do we need to do a blog post with recipes for those dishes? Wouldn’t that be a treat? Because they are truly delicious.) Warm and inviting, the kitchen is an exact reflection of who Glena is – she wants her family and friends nearby so that she can take care of the details for all of us. And then there’s the closet. Leave it to Glena to turn one of her extra bedrooms into a closet and then meticulously organize it, moving her washer and dryer in as well. This is an idea she had in high school. In the dreaded home ec class, we were all required to draw plans for our dream house. Guess which detail Glena drew in that none of the rest of us had thought of? The convenience of being able to take clothes right out of the dryer and hang them in the same room never dawned on the rest of us. Glena’s all about the details AND all about the big picture. We all know that from how smoothly the business end of Pick Up Sticks runs every day. And now you know it from seeing her house. 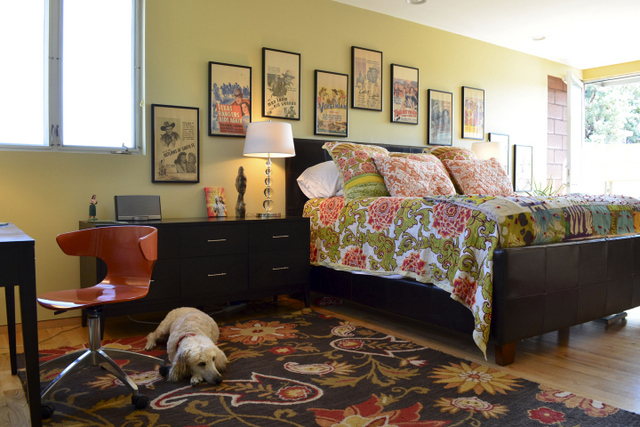 Be sure to check back next week for more inspiration from the homes of the Pick Up Sticks crew. And I’ll work on getting that red chile enchilada recipe for you. 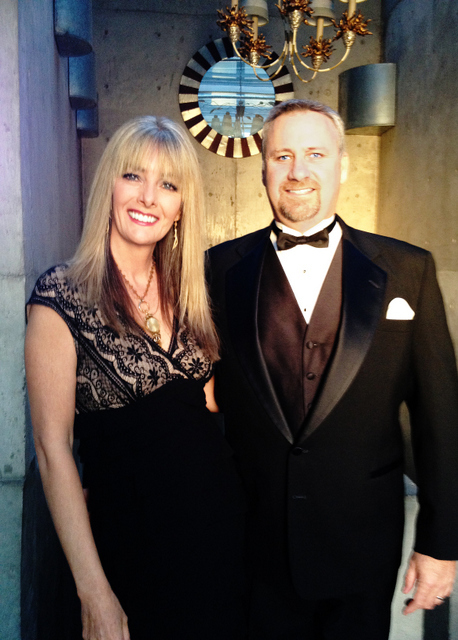 . .
Sabrina and Bruce, dressed for a night on the town at a benefit in downtown Albuquerque. You’ll more frequently find Sabrina in Austin Powers pajamas and Bruce in a wife beater and cargo shorts, but here they look especially nice in their black tie attire. Sorta like trained monkeys, Sabrina says. At Pick Up Sticks, we know that the process of creating is equally as important (or possibly more so) than what gets created. Having a space that inspires you, that envelopes you with light and sound and creativity, that frees you to do whatever it is that you do best, having a space that expresses you and therefore feeds your soul. . .well, that’s what makes it easy to get up in the morning and be the piece of the puzzle that IS Pick Up Sticks. We decided it would be great fun to run a series of the Homes of Pick Up Sticks. Everyone at Pick Up Sticks is an important part of the creative process, whether they’re designing the collage art or giving retailers advice on orders or helping customers come up with display and promotion ideas. Pick Up Sticks is a team effort. Seeing how everyone on that team feathers their own nests just might inspire you to surround yourself with your own brand of inspiration. Annie the poodle in the master bedroom. Vintage western movie cards, soft and worn bedspread, New Mexico sunshine coming through an east window, and an Art by Erin print. It’s a great place to wake up. . .
We start this series with Sabrina, the creative force behind almost all of the charm images at Pick Up Sticks. 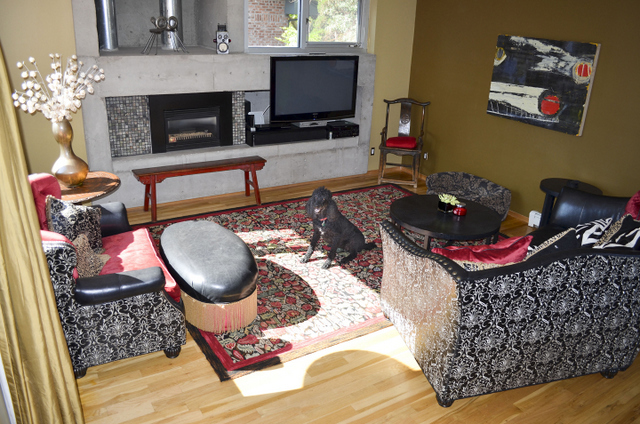 Sabrina has always lived in homes that are eclectically furnished and decorated. Walking through Sabrina’s house is frequently a bit of sensory overload – there are so many intriguing gatherings of artwork, kitsch, texture and color to admire. There really aren’t words to describe how incredibly fun and inviting her house is. These photos will have to do. Sabrina’s house isn’t Sabrina’s place without the poodles. 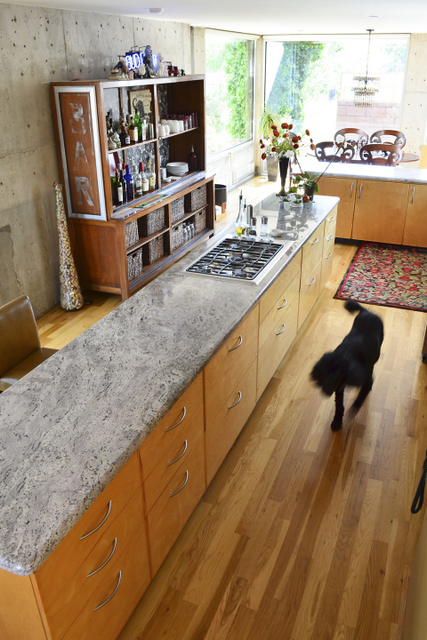 Here’s Joan, the queen mother of all poodles, wandering through the kitchen, waiting for Bruce to show up and drop something delectable on the floor. I’ve frequently sat at that bar, waiting for Bruce to drop something delectable on my plate. Cooking and entertaining are two of the things Bruce and Sabrina do best. . .
Here’s detail from the kitchen. Mucho booze, because as Sabrina says, they like to do a lot of entertaining, two friends at a time. 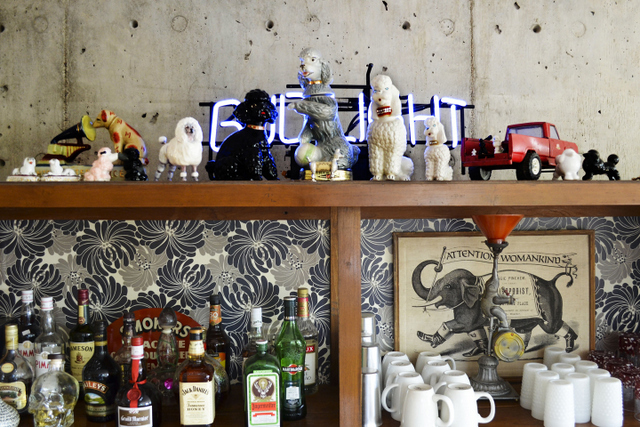 Also on display is a vintage neon beer sign, an antique elephant marketing sign (printed on linen), and the piece de resistance, the yard sale poodle collection. Rules are simple for the yard sale collection – never, never, never spend more than $10, and the poodle has to be the prefect mix of tacky, funky and beautiful at the same time. Every artist should have an inspiration room, and so, of course Sabrina has one (obviously Annie feels inspired sleeping there). With its hand-painted mural, Frida Kahlo doll, vintage watchmaker’s desk, and lots of antique and industrial pieces available to be physically handled and played with, this room gives Sabrina a break from the cerebral task of designing online. 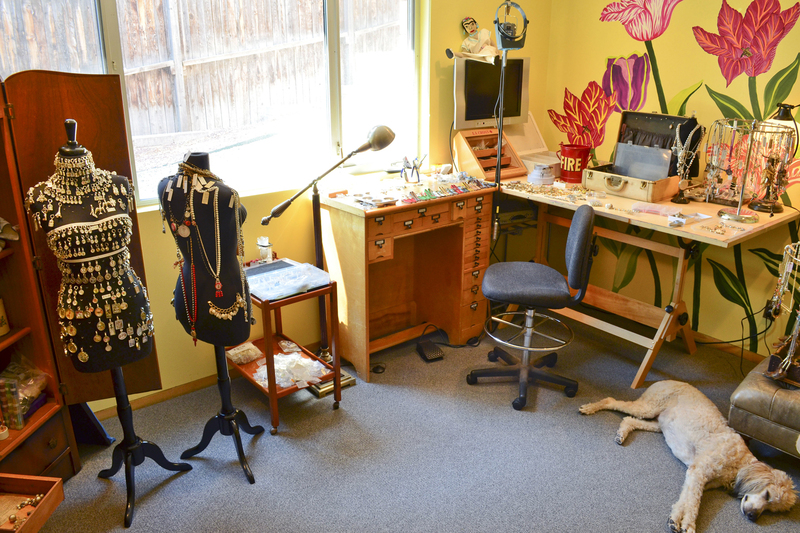 It’s the place where she decides what shape a charm should take, or how a compass might look on a piece, or how a trinket might match another vintage piece. Looks like fun, doesn’t it? Here’s where the real nutcutting occurs – Sabrina’s graphic design space. Joan and Alice love this room, since its where their girl hangs out every day. Every piece of furniture in this room is especially soft and snuggly, since everybody has to be comfortable to get work done. Of course, Sabrina is forced to sit in that desk chair while the poodles lay nearby and sigh or snore their inspiration. And at the end of the day, its the living room where the poodles congregate, leaving little room on the sofa for Sabrina and Bruce. I’ve been there and seen it – there’s frequently three standard poodles, their two masters (that’s a very loose term) and me, all on the couch watching a little True Blood on a Sunday night. 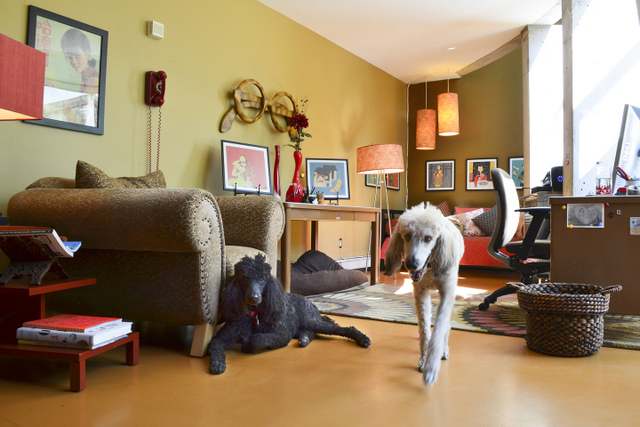 Sabrina’s house is filled with New Mexico light, kitsch, color and poodle love. It’s no wonder Pick Up Sticks’ designs are so whimsical and appealing. Next week: Glena’s house. You’re gonna totally want to live in this place. Amazingly enough, there’s a poodle there as well. Plus the closet of all closets – you won’t want to miss that post. We’d love to see where you live and how you inspire yourself. 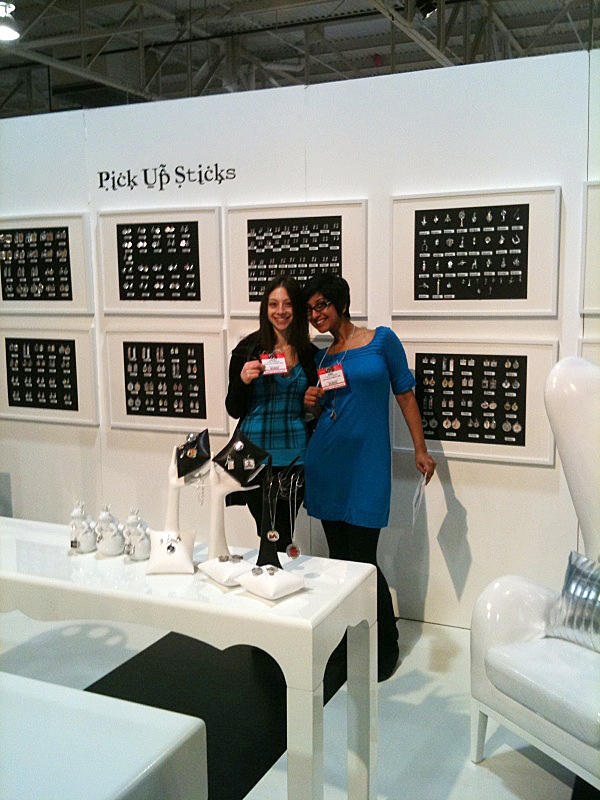 Send a photo to sabrina@pickupsticks.net and we just might put the place where you create on our Facebook page! When we were just starting out in this biz, we didn’t make a concerted effort to find mentors. We just sort of stumbled upon them. Remember Hondo and Alice? We met him while taking a break. Carol the Seaglass Girl? Sat up down the aisle from us and took us under her wing. Always, just at the moment when we felt like maybe our business needed a bit of tweaking, someone came along who had knowledge and experience, and by paying attention and listening, we learned amazing things. It’s difficult to say which of our mentors gave us the most guidance, but we definitely want to recognize Gil Tani and Lothantique. We wrote about him before in this blog – we called him our own Pick Up Sticks rock star. 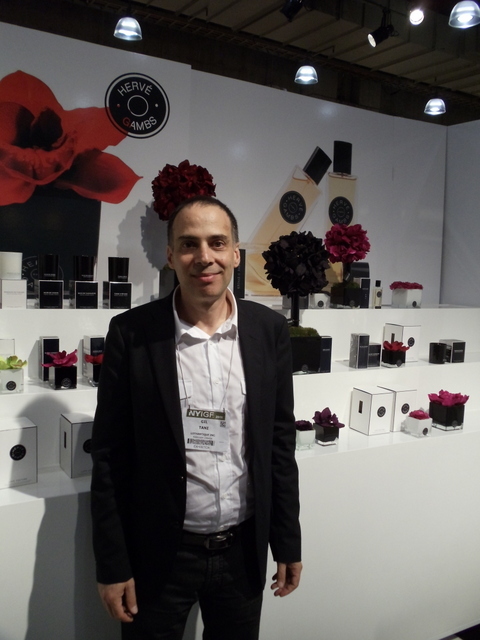 Gil is our distributor in Canada and his distribution company operates under Lothantique, Inc.. He’s also the owner of gorgeous retail space, Belle de Provence, in Toronto, so he has vast experience selling elegant gifts. Meeting Gil and his wife Yvonne when we did always felt a little like serendipity. Things hadn’t worked out well with our distributor in Canada, and Yvonne happened to walk into our booth in Atlanta on the right day. After discussing our needs, she led us to Gil so that we could talk to him about taking over the market in Canada. We’ve often discussed how we felt an instant connection with both of them. Our business in Canada soared under Gil’s direction, and this year he’s helped get us into the European market. We’re headed to London to do a show this fall, and all the credit goes to Gil! 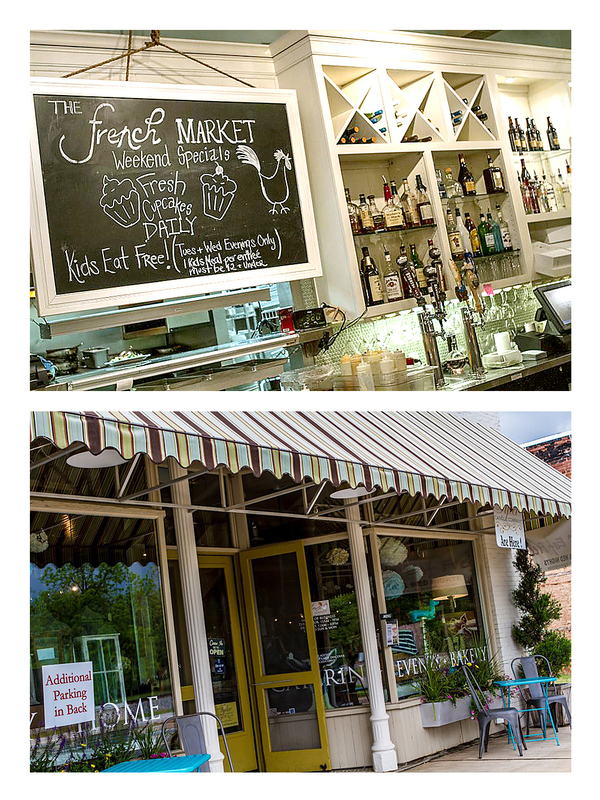 “We initially got acquainted with Pick Up Sticks as a retailer, we found the line at the Atlanta Gift Show, and carried it in our Belle de Provence store. 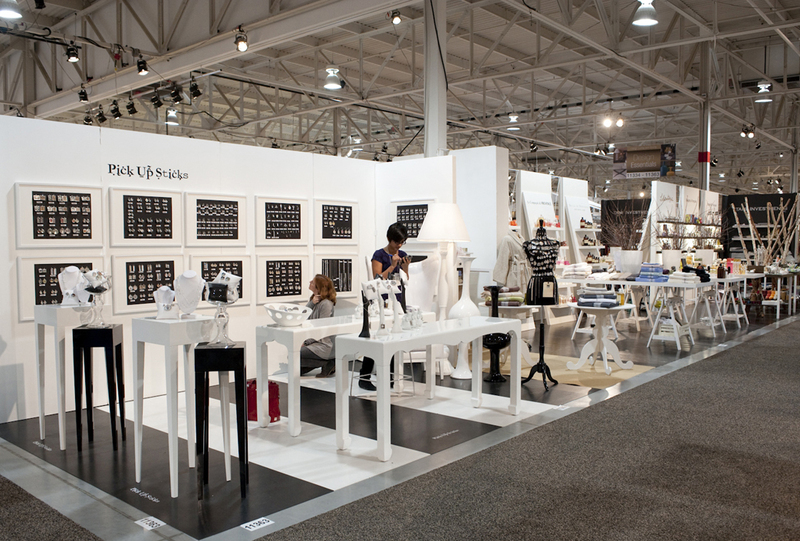 Two years later we were doing well with the product in our store and Sabrina & Glena were looking for a distributor in Canada. As we love the line we volunteered to represent them in Canada. We found Glena & Sabrina very open & friendly and the connection was instant. We’re forever grateful to Gil and Yvonne for taking a chance with Pick Up Sticks and for continuing to give us ideas for building our business. Check out their websites – their product is gorgeous and very luxurious and we’re sure you’re going to want to place an order. And if you’re in London in September, stop in and see us. Thanks, Gil, for inspiring us to make that big move!